Approximately 29 million Americans age 20 or older have diabetes. In the U.S., roughly 1 in 4 people over age of 60 is diabetic. Nearly one-third of American diabetics don't know they have the disease, which puts these people at an even higher risk of suffering vision loss and other health problems. More than one-third of those diagnosed with diabetes do not receive the recommended vision care and are at risk for blindness. If you are diabetic (or a member of your family has this diagnosis), safeguard your vision by contacting Foulkes Vision today sure to schedule a comprehensive eye exam. You can reach us online or call our practice directly at 630-724-1400. Diabetic retinopathy is the most common of these conditions. It affects roughly 5.3 million Americans age 18 and older, and is a potentially blinding diagnosis. Patients with this condition experienced swollen blood vessels inside their retina due to high blood sugar levels. This builds to fluid leakage within the eye and hinders healthy blood circulation. 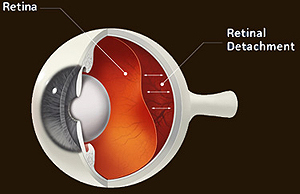 The most common symptoms of diabetic retinopathy are blurry, distorted vision and blindness. At Foulkes Vision, Dr. Foulkes can survey your diabetic eye condition and suggest various treatments. We provide you with hands-on guidance to help you manage diabetes so you can enjoy better vision and better health. Please call Foulkes Vision at 630-724-1400 today to learn about our diabetic eye care services.